Holy crap I finally finished it. I opened it up a few moments ago and noticed all I had left was to add text! So here it is! A HUGE personal project I've been doing for...god knows how long now. But I've finally gotten it done! I'll be adding a lot of details to Limi's life here in the description soon, I just don't have much time right now to type it all out lol. 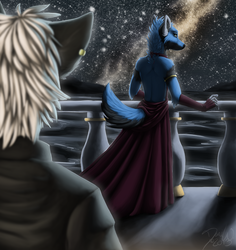 But you can see a major part of her beginning life from when I was doing my comic here: http://www.furaffinity.net/user/dark-destiny All you need to pay attention to is the Prologue. The rest is now inconsequential. This is a ref I plan on keeping for a long time to come, so that's why I spent so much time on it. I will be making a separate, MUCH SMALLER ref for shadowfang, since her design's changed a tiny bit. But more info to come later on Limi!